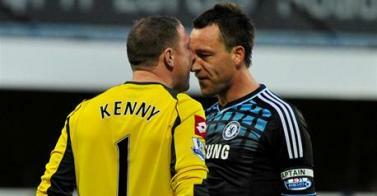 QPR have categorically denied Paddy Kenny, Clint Hill and Shaun Derry had been called to give evidence in the John Terry racism inquiry. More than one report has suggested the Rangers trio were set to back team-mate Anton Ferdinand's take on his altercation with Chelsea captain Terry during Sunday's west London derby at Loftus Road. All three are understood to be furious their names have been dragged into the saga, with Derry not even on the field of play when the alleged incident took place. A QPR spokesman said: "There is no truth in these stories whatsoever. None of the three players have been called to give evidence or will be called to give evidence."